I adore Miu Miu. I love the playful kitsch present in so many collections. 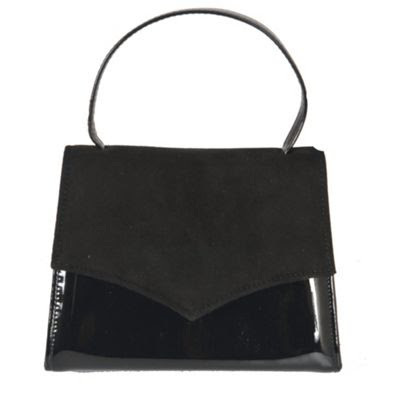 Spring Summer 2012 took a darker route with a 1940s goth horror effect. So how can we recreate this look using items exclusively from the high street? Let's take a look. The black wrap front blouse with blouson sleeves is surprisingly distinctive. 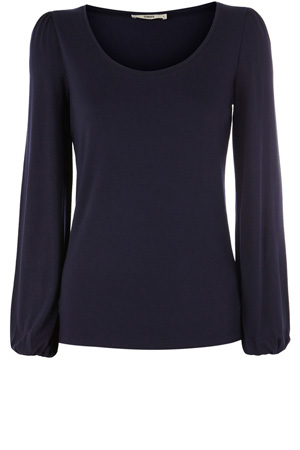 Yet this £18 Oasis top, teamed with a black stole or pashmina such as this Star by Julien MacDonald one (£22), will create a similar effect with a more casual twist. The real show stopper in this look is the slightly iridescent A line skirt. 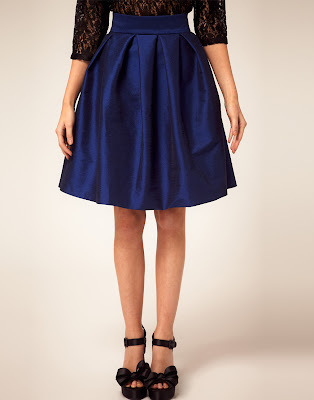 The blue Asos skirt above (£50) creates a similar mood with its shimmering effect, flared silhouette and modest length. 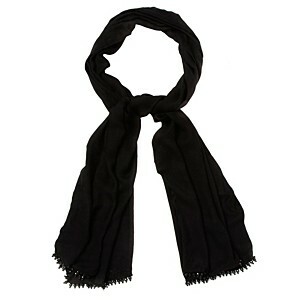 The vintage-look accessories pull this look together with velvet ankle boots and frame clutches. Recreate the textured style with these £60 River Island ankle boots and a £60 Debenhams handbag. The Miu Miu look would not be complete without a liberal smudge of red eyeshadow. After my emo obsession in 2005, I am quite the expert on red eyeshadow (even if I do say so myself!). I can vouch for Barry M Dazzle Dust in Red Cherry. 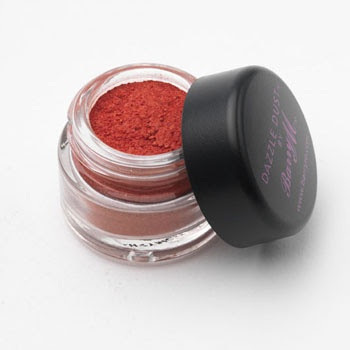 At only £4.59, It is super pigmented and has great staying power. Just be careful with the pot- this stuff is extremely loose and has a tendency to leak everywhere. And, whatever you do, do not drop it on a gold carpet. My grandma's will never be the same again! So there we have it. A complete head-to-toe Miu Miu inspired look for £214.59. Lovely jubbly! Really great stuff! Love those shoes! !